1. 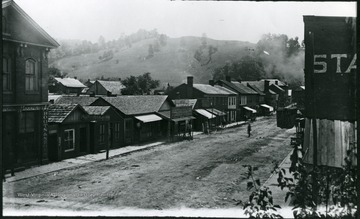 Street Scene in Weston, W. Va.
Street Scene in Weston, W. Va.
Thursday, January 10, 1884, 2:00 p.m. Looking from the window of a hotel. 2. 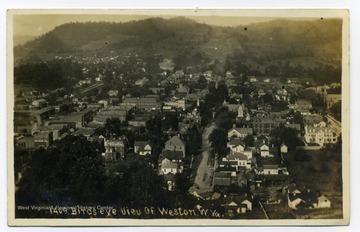 Bird's Eye View of Weston, W. Va.
Bird's Eye View of Weston, W. Va.
3. 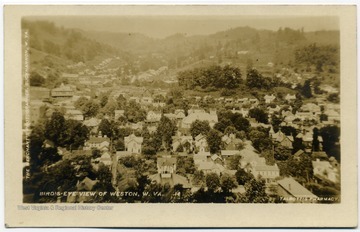 Bird's Eye View of Weston, W. Va.
4. 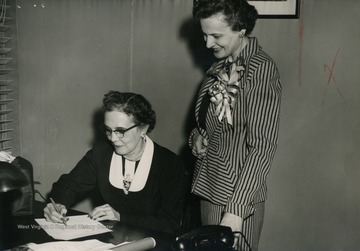 Helen Holt Stands Beside Mrs. Davis While She Signs Oath of Office, Weston, W. Va.
Helen Holt Stands Beside Mrs. Davis While She Signs Oath of Office, Weston, W. Va.
Caption on back of photograph reads: "Picture taken at Weston as Mrs. Davis signs oath of office as only woman member of State Advisory Board Department of Public Assistance. After Mrs. Rush Holt, Secretary of State, administered the oath." 5. 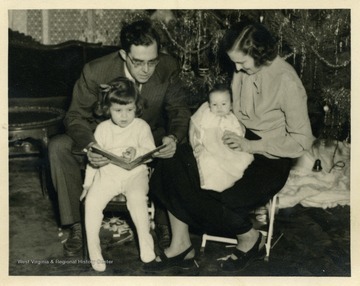 Senator Rush D. Holt and Wife Helen Holt With Their Children, Helen Jane and Rush Jr. Senator Rush D. Holt and Wife Helen Holt With Their Children, Helen Jane and Rush Jr. The Holt family gathered in front of their Christmas tree. 6. View From Hill of Farmland and Homes in Weston, W. Va.
View From Hill of Farmland and Homes in Weston, W. Va.
7. 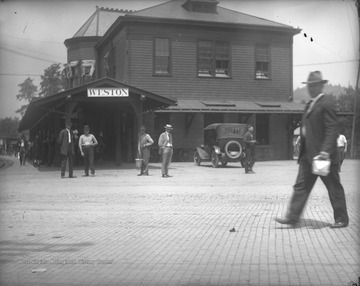 Train Depot, Weston, W. Va. Train Depot, Weston, W. Va.
8. 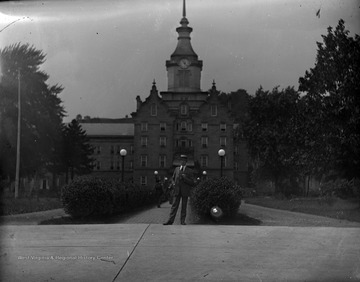 Man in Front of Trans-Allegheny Lunatic Asylum, Weston, W. Va.
Man in Front of Trans-Allegheny Lunatic Asylum, Weston, W. Va.
Also known as Weston State Hospital. 9. Waldeck Methodist Church, Weston, Lewis County, W. Va.
Waldeck Methodist Church, Weston, Lewis County, W. Va. The church was organized in 1833. 10. Murphy's Creek Baptist Church, Weston, Lewis County, W. Va.
Murphy's Creek Baptist Church, Weston, Lewis County, W. Va. The church was organized in 1844. The present building was completed in 1875. 11. St. Patrick's Catholic Church, Weston, Lewis County, W. Va.
St. Patrick's Catholic Church, Weston, Lewis County, W. Va.
St. Patrick's Schools is to the left of the church in the picture. 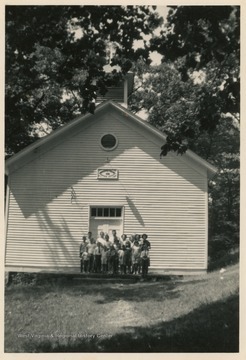 The church was organized in 1845. 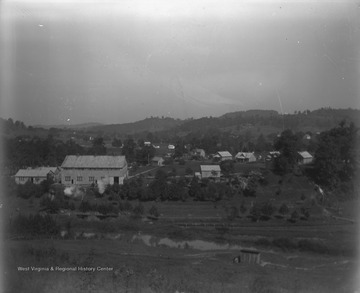 The present church building was opened in 1915. 12. Mt. 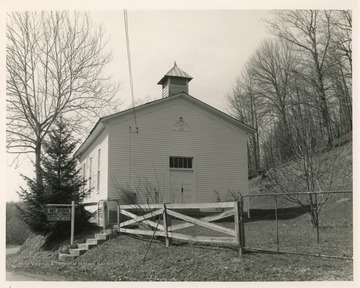 Zion Baptist Church, Weston, Lewis County, W. Va.
Mt. 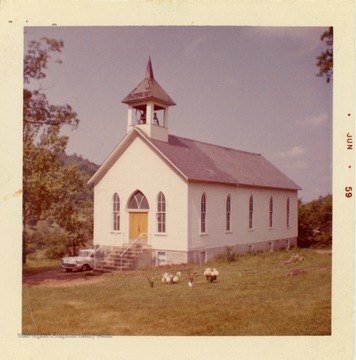 Zion Baptist Church, Weston, Lewis County, W. Va. 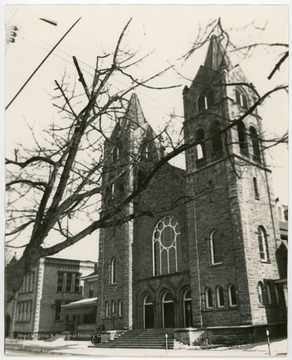 The church was organized in 1846 and the present frame church was built in 1884.